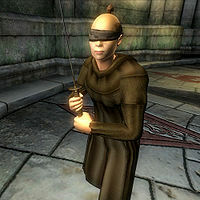 Blind Moth Priests are the Monks that read the Elder Scrolls in the White Gold Tower. As a result of reading the Elder Scrolls over their lifetimes, they eventually lose their sight. Blind Moth Priests can be found during the quest Turning a Blind Eye. They are the guardians of the Savilla Stone, the first item the Gray Fox requests during the strand of quests you do for him in the Thieves Guild. Although they are blind, they can still detect you just as well as a normal person could and are also affected by Chameleon and Invisibility. They favor Akaviri weapons. These NPCs are also the priests from whom you steal an Elder Scroll during The Ultimate Heist quest. All Blind Moth Priests have an hidden attribute named Blindness set to 100, this has several effects. Firstly the player has a 100% chance of being able to hide, even right in front of a blind actor, regardless of sneak. As a Blind Actor can still hear, this does not give the player a 100% chance of being undetected if they are moving, but as long as the player is not moving while in sneak, the actor won't know that the player is there. There is also a 100% chance that a Moth Priest will not notice when the player steals an item in front of them, but will respond to being pickpocketed. However, despite the fact the priests are blind, they still act like regular NPCs. For example, they will still say things like "I'd better cut down on the ale, I'm starting to see things!" This page was last modified on 6 February 2011, at 09:43.